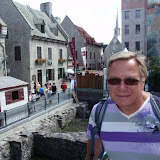 August 3rd 2011, with the help of Olga ( our GPS ) , we arrived in the old town of Québec City in the province of Québec. We parked at St. Paul and Abraham and walked by our hotel we stayed in two years ago in winter, and climbed up to the Chateau Frontenac. Québec City is the heart and soul of French Canada. In 1759 the famous battle on the Plains of Abraham where the British General Wolfe defeated the French general de Montcalm. Both generals were killed, but Québec fell to the British. But in 1774 the British government passed the Québec Act, and granted French-Canadians religious, and linguistic freedom. This historic arrangement is still for ever contested and discussed to today. Lucky for all of us Canadians, we have a wonderful French culture with a North American twist right here in Canada in the Province of Québec. 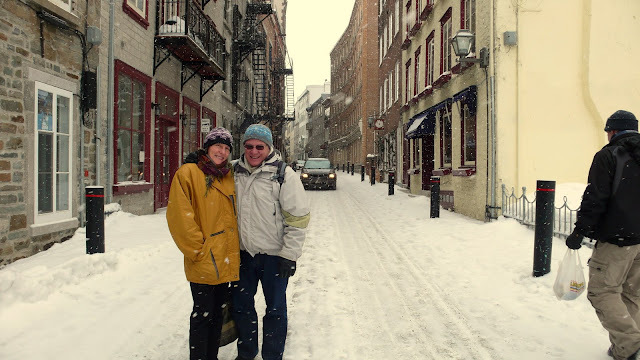 Anders and I love to walk the small narrow streets here in Québec City with their unique shops and boutiques. 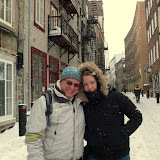 In the lower town we found fashion for women and men designed and made right here in Québec at affordable prices. Even if you do not buy anything, go and get pampered and helped by knowledgeable staff at the exclusive shops in rue Petit-Champlain, Sous-le-Fort, etc. The people helping you show style, humour, and class. Most of them speak a little English. Two years ago we visited many of the famous historic sites including La Citadelle, Place Royale, Vieux Port, and the grand Chateau Frontenac. In winter, wear warm boots, in summer, a sun hat. This city needs to be explored by foot, a week is the minimum time to get immersed into Québec City. Naturally, besides the historic sites, the beautiful churches, the quaint streets, the fashion, there is the food and wine. Take time to sit down and indulge into some of the culinary delights. Choose a restaurant with French only menu cards, the food will be more adventurous, the service more flamboyant, and it will be a true Québec treat! Dining in Québec City is just simply wonderul. By five o'clock we wanted to head back to our campsite Plage Fortier, but the trafic was not moving at all, Québec was celebrating "Nouvelle France" and everybody was scurrying somewhere to celebrate. This celebration happens every year in Vieux-Québec with various cultural, musical and historical activities. Ah, no problem, we found a nice terrace to sit outside and enjoyed an other glass of wine. For more pictures of this part of the trip click on the picture below or go directly to the slideshow here.